By the time of his death in 1937, John D. Rockefeller had amassed a wealth of roughly $340 billion in today’s dollars. That’s four times what Bill Gates had last year. And just to put a little bit more perspective on this astronomical figure, consider that when Rockefeller was laid to rest, his oil fortune was equal to 1.5% of America’s total economic output. Sit back and think about that for a second... don’t worry, I’ll wait. But, dear reader, although Bill Gates may not be as wealthy as Rockefeller, he did reach billionaire status much, much quicker, at the tender young age of around 31. It took Rockefeller 77 years to earn his first billion. What took so long, you ask? Well, it’s because Rockefeller can thank someone else for that mighty feat. His name was Sylvanus Freelove Bowser, and I know for a fact that you’ve never heard his name before today. Be honest, did you immediately Google his name? Don’t worry, you’re not alone. I did the same thing. Aside from having a badass name like Sylvanus Freelove Bowser, he is arguably the sole reason the Rockefeller fortune surpassed that billion-dollar benchmark. You see, Sylvanus was an American inventor who was credited with inventing a piece of technology that changed the petroleum industry forever: the automobile fuel pump. In 1885, he sold an earlier version of this technology, which was designed to pump kerosene, to the owner of a little grocery store in Fort Wayne, Indiana. It was certainly put to good use. You can probably guess how dangerous it was transporting such an inflammable substance as kerosene at the turn of the 20th century. After the success of his kerosene pump, Sylvanus started up his own company, then took advantage of a new boom: the automobile. 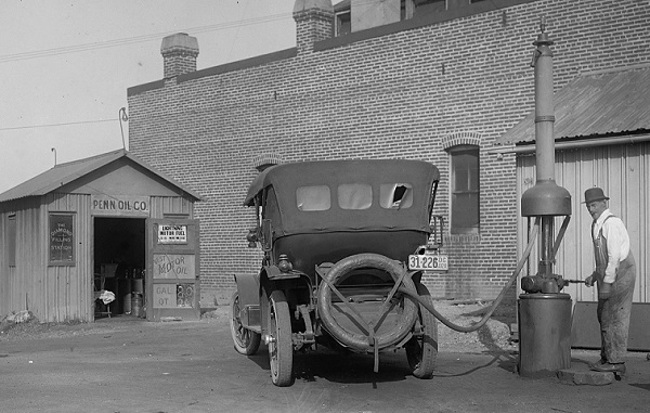 By 1905, his “Self-Measuring Gasoline Storage Pump” helped early motorists fill up their tanks. The cash rolled in for these filling stations, and the story goes that the first Gulf station in Pittsburgh sold 30 gallons of gasoline at the cool price of just $0.27. This grossly overlooked invention in American history was nothing short of an energy revolution. 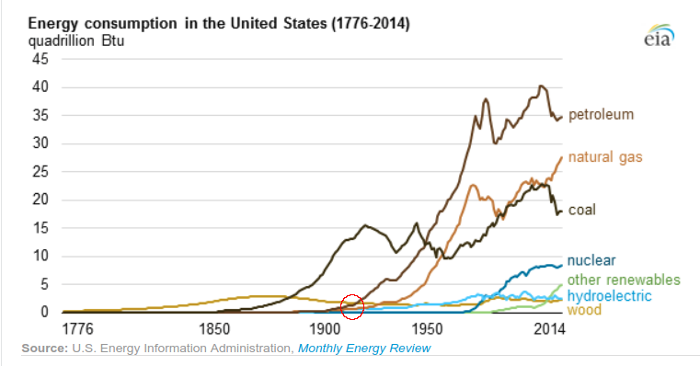 Oil consumption in the U.S. exploded and quickly overtook both coal and natural gas as the United States’ largest source for energy by the mid-20th century. After the first filling stations were set up, it only took a few years before a then 77-year-old John D. Rockefeller became the world’s FIRST billionaire. Those who control the world’s energy control the world. That’s not some spicy hyperbole, either. Right now, the exact same transition is taking place that occurred a hundred years ago. This time, traditional gasoline-powered cars are the endangered species. Now, don’t get me wrong — I don’t hold any delusions that this transition will take place overnight. I guarantee you that people will be filling up at gas stations for decades to come. If Rockefeller’s venture into the petroleum industry taught us anything, it’s that the key is to invest in the early stages of any boom. 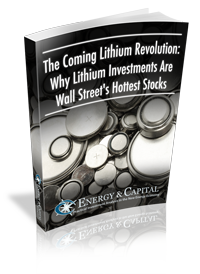 That’s how my readers banked a 200% profit from a single lithium stock after lithium prices spiked between 2015 and 2017. It’s how Rockefeller made his first billion dollars in 1916. The formula is simple: Get in early or watch from the sidelines. Like I said earlier, history is repeating itself. This time, however, it’s in the vehicles that will take us into the 22nd century. But there’s more to this historic transition than electric vehicles. Let me be clear; this is far bigger than just Tesla. In fact, there’s a new type of automobile being developed that already has a greater range than electric vehicles. Of course, that’s not to mention the fact that it can be refilled in a fraction of the time it takes the Tesla models to recharge. And it’s being powered by a new fuel source: hydrogen fuel cells. Trust me, there’s plenty of room in this market for everyone, from EVs to hydrogen fuel cells. Thing is, it’s going to come much quicker than most people realize. Since 2016, 14 countries have announced bans on traditional fossil-fueled vehicles. China, Denmark, France, Germany, Spain, the United Kingdom, the Netherlands... the list goes on and on, but you get the point. I don’t want you to take my word at face value. I want you to see this energy revolution for yourself. I strongly recommend you take just a few minutes out of your day and learn the details of one company that holds the key to disrupting the $1.2 trillion energy revolution. All the details are locked inside this investment report. And because you’re a valued member of our investment community here at Energy and Capital, you can access it at absolutely no cost to you. You have to check this one out for yourself.